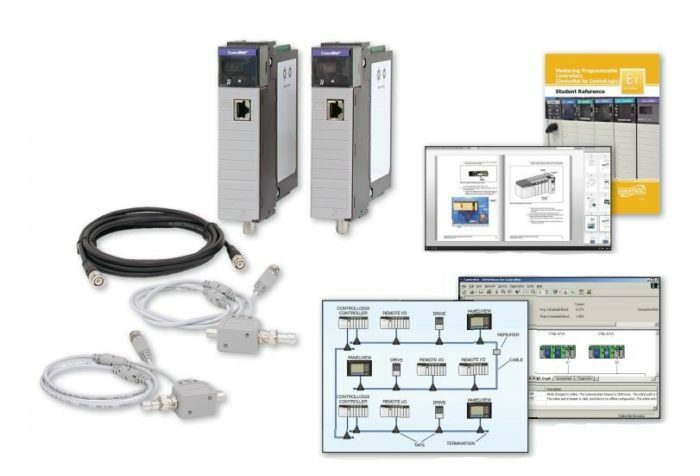 The PLC ControlNet Learning System (89-CN-AB5500) adds to the Programmable Controller Troubleshooting Workstation (890-PECB) and PLC Troubleshooting Learning System-AB ControlLogix (890-AB5500) to teach the fundamentals and troubleshooting of industrial communications networks using ControlNet, a popular ControlLogix control network. ControlNet is a high-speed deterministic network for transferring both scheduled and unscheduled messages on the same cable. The rapid exchange of data between departments within a manufacturing facility has become an integral part of the production process. Technicians must be able to understand, install, and troubleshoot these networks. The 89-CN-AB5500 includes: two ControlNet modules, two ControlNet taps, ControlNet cable, RSNetWorx Software, supplemental disk, mounting hardware, student curriculum for both theory and lab, and a teacher’s assessment guide. Students will learn how to install, configure, and troubleshoot ControlNet networks.